Sporting a dramatic new redesign for 2016, and a with a host of new technologies adorning the car's interior, the 2016 Honda Civic continues to be a leading option for buyers in the market for a safe, fuel efficient, and reliable vehicle in the compact-car class. Available as a coupe or sedan, the new Honda Civic offers plenty of options and features to keep drivers happy and comfortable, regardless of which trim level they choose. The 2016 Honda Civic boasts a tremendous slate of technology features available for tech-savvy drivers. There is a large, high-def touchscreen display that gives drivers access to the 2016 Civic's settings. Buyers also delight in the car's electronic parking brake which has taken the place of the old-fashioned pull lever, giving drivers even more space inside the cabin. Civic trim levels outfitted with the six-speed manual transmission also come with a standard LED shift indicator. Higher-level trims for both the Civic sedans and coupes give drivers even more groundbreaking features. Those taking a glimpse at the Civic will probably notice the car's new look. The newly redesigned Civic is two inches wider and one inch lower, giving it a more aggressive, sportier stance than its predecessor. The 2016 Civic's elongated hood and sleek, aerodynamic body give it the look of a sports car, and the Civic maintains the convenience drivers want in a 4-door sedan. Interior comforts only add to the 2016 Honda Civic's appeal, and the car continues to be one of the best-selling vehicles in the United States. With both the coupe and the sedan, the base model is the Honda Civic LX. Drivers opting for the Civic LX Coupe or Civic LX Sedan get features including LED daytime running lights, anti-lock brakes, a multi-information display, Bluetooth® HandsFreeLink® and streaming audio, and automatic climate control system, and much more. A CVT (continuously variable transmission) is available for the Civic LX as is Honda Sensing®, Honda's suite of safety technologies. Each Civic trim level offers drivers a host of features, with the Civic Touring as the "loaded" model. Buyers opting for the Touring trim receive premium features, including a Forward Collision Warning (FCW), Lane Departure Warning (LDW), a leather-wrapped steering wheel, automatic-dimming rearview mirror, Honda's Satellite-Linked Navigation System* with voice recognition, and Honda HD Digital Traffic and Song by Voice® (SBV). The CVT transmission is also standard equipment on all Civic Coupe and Civic Sedan models, except the base model LX. The new Honda Civic offers drivers great gas mileage and performance, two things not always associated with one another. Regardless of the trim level selected, every 2016 Honda Civic is outfitted with a powerful and fuel-efficient inline 4-cylinder engine. The car was engineered with Honda's advanced i-VTEC technology. The 2016 Civic's standard, 2.0-liter direct-injected engine is considerably more commanding than the preceding model's 1.8-liter motor. Those craving hybrid-like fuel economy coupled with spectacular performance can opt for the new Civic equipped with a 1.5-liter turbocharged engine that generates 174 horsepower and provides an EPA-estimated 42 miles per gallon on the highway*,giving drivers the best of both worlds. Buyers can choose a smooth-shifting CVT or a sporty six-speed manual transmission. The new Civic also gives drivers a sportier ride, thanks to its improved suspension and lowered ride-height. The 2016 Civic offers plenty of room inside for passengers and cargo alike. With seating for up to five adults, the Civic now offers an additional two inches of legroom over the previous year model. The cargo area in the truck now offers more space, too. With even more room in the Civic's cabin and in the trunk, the 2016 Honda Civic is an excellent choice for growing families on the go or for car-pooling commuters driving to and from work. Inside the vehicle, Civic LX drivers are treated to cloth seats while buyers opting for higher trim levels get leather, heated seats to keep them comfortable no matter how cold the weather is outside. For drivers opting for the 2016 Honda Civic in the base trim, the car is remarkably safe. For starters, Honda used an advanced welding process to give the 2016 Civic excellent protection for everyone inside the vehicle in the event of a collision or other accident. And Honda also offers even more safety equipment and features, along with driver assist technologies, inside the new Civic. Honda Sensing®, the company's suite of safety features, helps drivers to maintain awareness of their surroundings while driving the car. There is an optional adaptive cruise control to help the car maintain a safe distance between it and the vehicle directly in front of it. Once you take a look at everything the new Honda Civic has to offer, you will want to see it up close and take it out for a test drive. So if you are looking for a Honda dealership in Santa Rosa, we invite you to come to Manly Honda today. We are proud to serve Sebastopol, Petaluma, and Santa Rosa, CA, and we offer a terrific inventory of new Honda vehicles, including the all- Honda Civic. 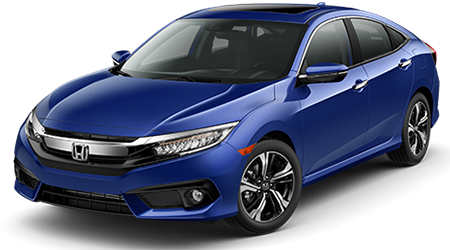 Take a look at our website to see all of the new Honda Civic Coupes and Civic Sedans we have in our current inventory. You can check out features, select an exterior color, and learn more about each vehicle's trim level and specifications. Once you find the car that interests you, give our sales team a call to make an appointment for a test drive. We think you will love everything about the 2016 Honda Civic! Shop now or just come to our new car showroom today to take a test drive. When you are shopping on our website, you can make use of the plentiful buttons, options, and tools to help you find what you are looking for or speed up the buying process. Do you have a trade-in car? Use the handy Value Your Trade tool to see how much it might be worth. You can also save time by applying for an auto loan via our online car loan application. You will receive a quick pre-approval, and you will know how much you can spend before you step foot into our showroom. Come to Manly Honda, a new and used Honda dealership near Petaluma, today to discover the all- Honda Civic! After you buy or lease a new Civic, make sure you return to us for scheduled maintenance, auto repairs, and genuine Honda auto parts and accessories to dress up your ride. At Manly Honda, our goal is to give you excellent customer service, whether you shop on our website or in person.